We took off on a South West England road trip in June, when the foxgloves were in full bloom and the weather was comfortably warm. 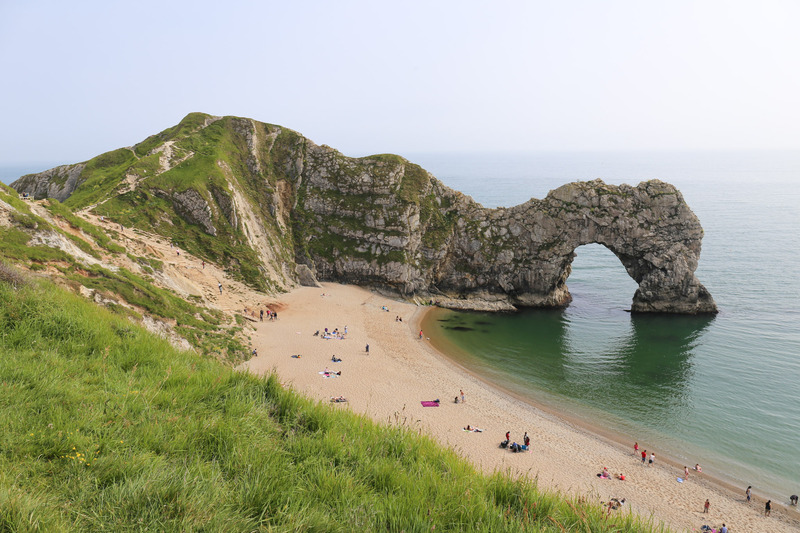 Visiting the iconic limestone arch of Durdle Door was a peak priority on this seven night adventure. Dorset is on the English channel, and this particular stretch (from Exmouth in East Devon to Studland Bay in Dorset) is called the Jurassic Coast, which is a 95 mile (around 150km) area with World Heritage status. The dramatic cliffs around this coast hold records of 185 million years of the earth’s history. The also hold the astonishing beauty craved by many a nature loving traveller. The drive down into Dorset and towards the coast at Durdle Door winds you through green swathes of English farmland, edged by stone walls probably laid by hand, that mark the boundaries of one lane roads not marked or used as such. Arriving at any destination around these parts can mark the relief of a break from hill starts and blind corners. A short walk down a dusty path from the car park (yes, this is a tourist destination, but thankfully a low key one) and you find yourself walking alongside the picturesque Lulworth Cove – a spot that would be worth the visit in itself. Lined by pink wildflowers that sit atop a blanket of grass that rolls down to the beach, it can be surprising how aquamarine in colour the water is – am I really in England? And this whole South West England road trip had me reflecting on this – on how (and perhaps this is just me) my thoughts of England are often focused on history and Big City London and the monarchy, rather than what I was discovering here – that Britain is a place of immense natural beauty, of coastal charm and green spaces – mixed in with that history, both human and also of the earth – 185 million years of it. These giant cliffs with eroded arch stretching into the sea are definitely a mental escape from a hurried inner-city life. This is some of the most beautiful coast I’ve seen anywhere. I would love to do a long multi-day walk along the South West Coast Path, which winds past Durdle Door and along down into Cornwall and beyond. Do you have a favourite spot on the English coast? If so, please post about it in the comments below! Another lovely write up of a less visited area of our country by foreign tourists which is great. London, Edinburgh, Stratford take a hammering! Our own plans this year are to use our 4 months or so of usual travel visiting parts of England we haven’t seen before! Thank you Dr B! And that’s a great idea to explore England! My fiancé is from Liverpool (well, the Wirral) so we spent a couple of months exploring England last summer and the main thing it made me realise is how much there really is to explore! Can’t wait to get back there. Happy adventuring!